DIET (δίαιτα) in the ancient Greek language meant ‘way of life’ encompassing food, exercise, massage, baths and other aspects of everyday life activities. It has been known since Ancient times that food, exercise and lifestyle in general, plus the external environment in which people live, have a definite influence on their health. Hippocrates changed the diet of his patients to help them get better. 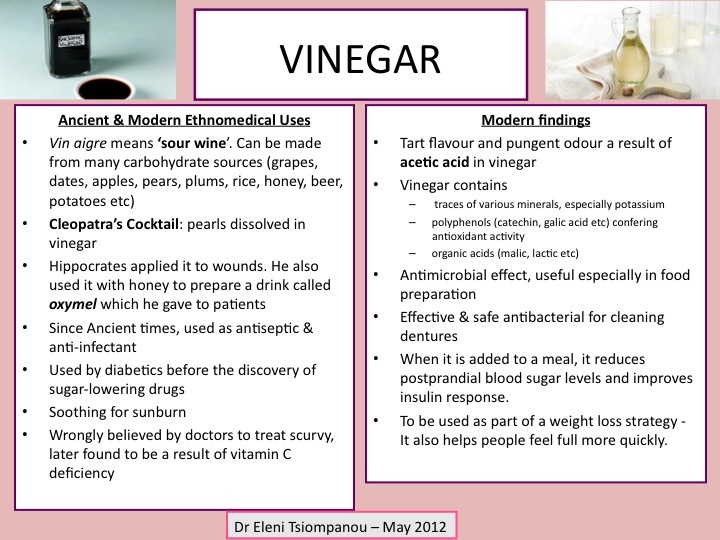 He advocated a number of foods, but he believed that honey and wine are the two most important foods for health. A story found in a famous ancient book, the ‘Deipnosophists’ (translated as the ‘Banquet of the Philosophers’) and written by Athenaus in the early 3rd century AD, gives us an idea of the nourishing power of honey. According to it, Democritus of Abdera who was often called the ‘Laughing Philosopher’, was coming to the end of his life, at the great age of 104. His food intake had gradually reduced and he was expected to die. It was, however, the time of the important Thesmophorian festival and his centenarian sister who looked after him at his home, asked him not to die during the festivities so that she could take part in them. 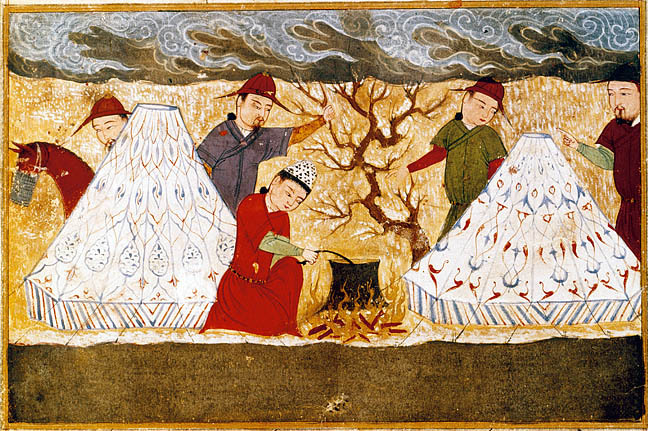 Wanting to grant her request, he asked for a pot of honey to be brought to him and was kept alive by inhaling the fumes of it, for three days. 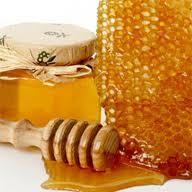 When the festival finished, the pot of honey was taken away and he passed away without any suffering. the anti-cancer effect of the chemotherapy and reduce the side effects from the treatment. Because normal cells can protect themselves better during fasting, but cancer cells cannot. In conclusion, this is an exciting area of on-going research. What and how we eat can affect us in profound ways. 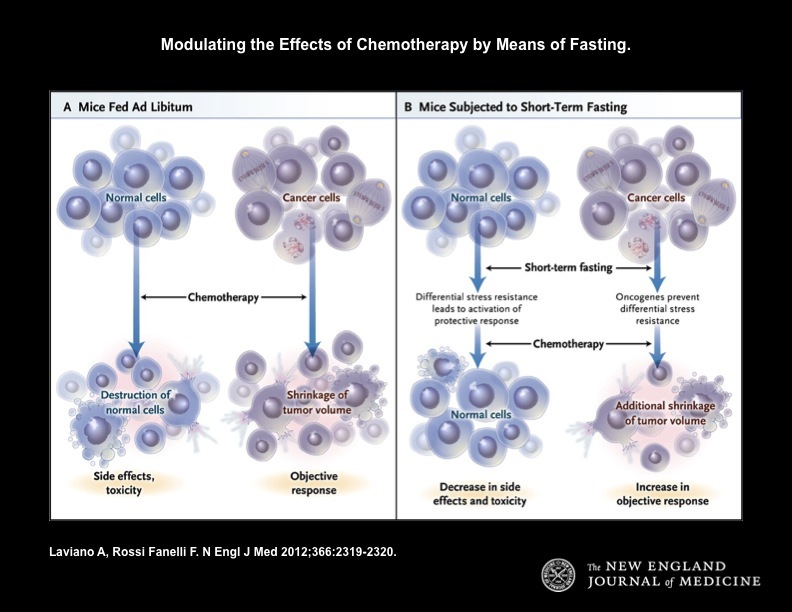 “Recent research that short-term fasting before or after chemotherapy, or at both times, induces differential stress resistance in normal and cancer cells. In normal cells, fasting activates protective metabolic pathways that confer resistance to oxidative stress (Panel B). In contrast, yeast transformed with an activated oncogene is unable to turn on the protective response and thus remains sensitive to oxidative stress. 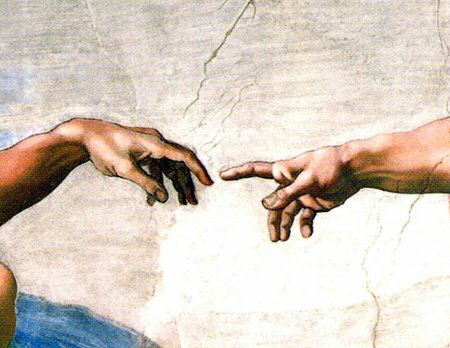 ‘Galen’ – first pointed me to Hippocrates. 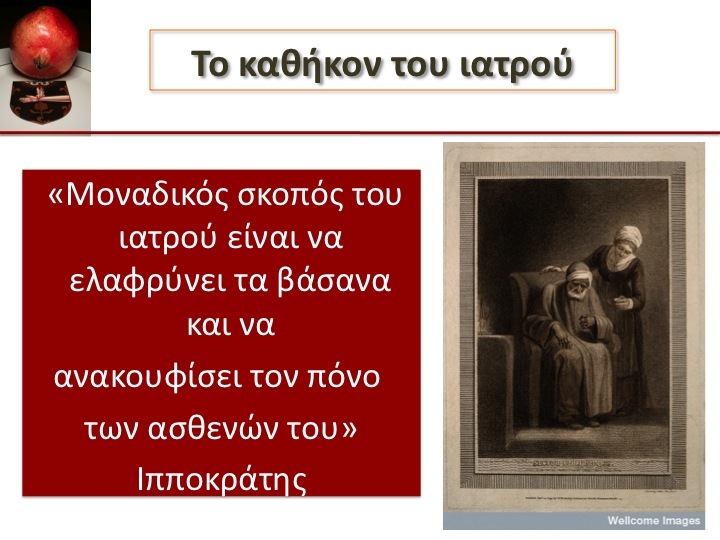 ‘Galen’, not the great physician philosopher of ancient times but a ‘modern’ version who, for me, was no less inspiring, was the pseudonym used in Kathimerini, a daily newspaper in Greece, by a Professor of the History of Medicine in Athens, Dr Spyros Marketos. Every Sunday, absorbed by his words, I found inspiration particularly about his accounts of the lives and work of great medical scientists that had shaped modern medicine; the pathologist, George Papanikolaou, DNA pioneers James Watson and Francis Crick. In 1987, while still a medical student in Northern Greece, I wrote to ‘Galen’ asking to meet him. ‘Galen’, Professor Marketos, replied inviting me to visit him. Travelling overnight in the sleeper of a slow train from Thessaloniki to Athens, I arrived as the sun appeared on the horizon. I stayed in a small hotel near the Acropolis and walked to his office in Kolonaki, in Athens. This was to be the first of countless trips over the next few years. Professor Marketos had invited me to join his circle of young medical students studying the history and philosophy of medicine. And so my journey began. Studying the books in the Hippocratic Corpus, I discovered that Hippocrates and his followers knew how to use diet to restore health in people. Despite the fact that they did not have our anatomical, biochemical and physiological understanding, they used methods from an understanding of the needs of the human body. From ‘Galen’ and my own interest in Hippocrates, I went on to study for an MSc in Nutritional Medicine at the University of Surrey, the first university-level, evidence-based Masters degree course in this subject in the UK. Recently, on a visit to Kos, continuing my research into the life of Hippocrates, my journey has, in a sense also brought me back to ‘Galen’. 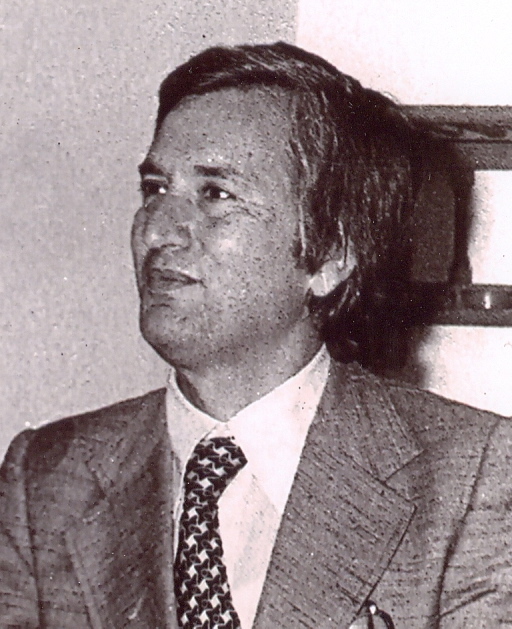 I feel truly indebted to Professor Spyros Marketos who inspired me at the beginning of my medical career. 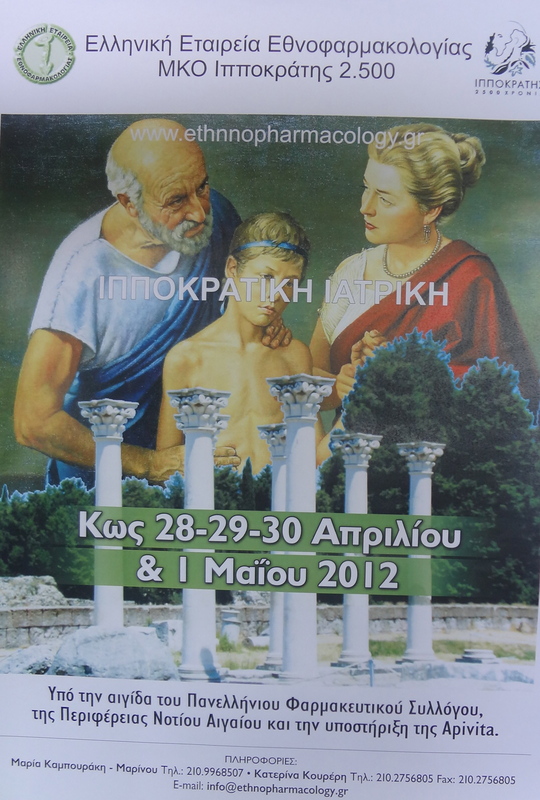 I just returned from a trip to Kos, the birthplace of Hippocrates, the father of Medicine. This is an exceptional island which is blessed with the most extraordinary flora. Some of the plants and trees are unique and rare. Kos has a mild climate, rich soil and amazing sea and surroundings, which not only feed the people with nutritious food but also provide beautiful sights to nurture their soul. 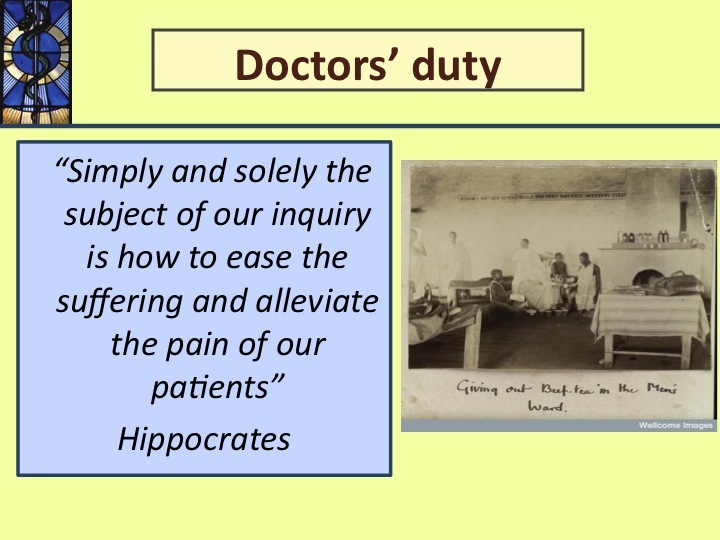 It is not perhaps by coincidence that Hippocrates developed his medical theories and practice on this place. 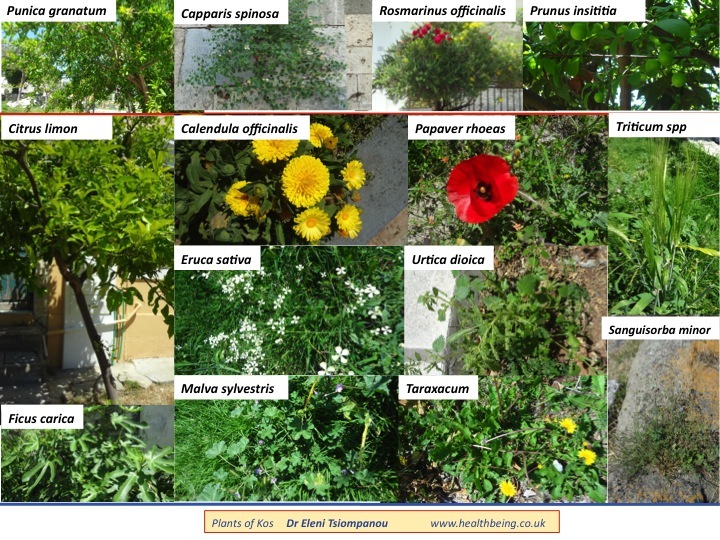 Walking in the centre of the town of Kos, near the plane tree under which Hippocrates allegedly taught his students, I discovered and photographed many edible plants that also have great nutritional power and healing properties. A few of them are seen in the slide above. 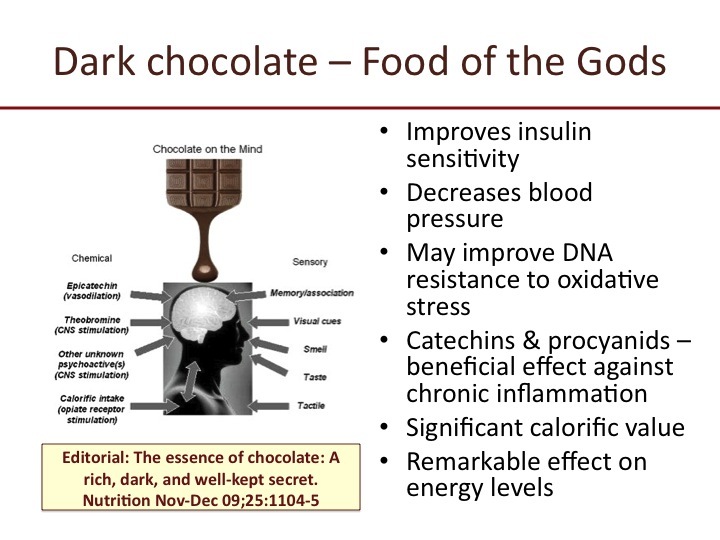 Dark chocolate, often referred to in historical literature as the ‘Food of Gods’, is high in calories but is also rich in various polyphenol antioxidants and other positive nutritional factors. These have been found to have anti-inflammatory properties and an effect on mood, memory and other neuro-psychological parameters. Chocolate high in cocoa has also been reported to improve symptoms in people with chronic fatigue syndrome. Further research will allow us to establish how this tasty and nutritious food can help us feel better. But in the meantime, we can all enjoy its flavour and sweetness, now knowing that, at the same time, it may also be beneficial to our cells. An unusual but delicious recipe for Chocolate Mousse has been created by Japanese acupuncturist Michiko Yamaguchi. It is satisfying, richly flavoured and wonderfully textured. 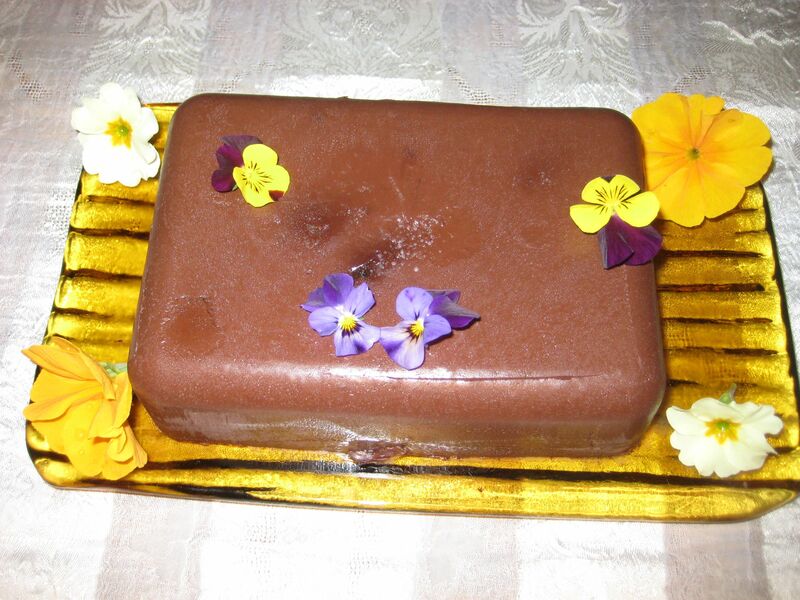 The recipe uses agar-agar which is derived from seaweed. Agar-agar is used to create jellies and puddings and is suitable for vegetarians or those who want to avoid the pork-derived gelatin. Soak agar-agar in water for a few hours. Drain it and put in a non-stick pan with 500 mls water. Let it boil. Add the chocolate, honey and spices. For a lighter mousse you can add cream. Stir the mixture for 10 minutes, until it becomes slightly thicker, but don’t expect it to become jelly when hot. Pour the mixture in a container. Add the cherries and chestnuts in various places in the mixture. Let it cool for a few hours. Once set simply turn it on to a plate out of the container. Serve in small pieces with mulberry syrup over it. A physician was in the habit of taking his son along with him when visiting the sick. ‘The patient has eaten pomegranates’. ‘Yes, that is quite true,’ said the relatives, ‘we gave him some yesterday’. ‘And he has also eaten some curdled milk,’ the physician continued. ‘Yes, he had some of that as well’. On the way home, the son asked his father how he knew that the patient had been eating curdled milk and pomegranates. ‘Nothing could be simpler’, said the physician, ‘I saw a few pomegranate peels in a corner and I noticed traces of curdled milk in a man’s moustache. I know that when there is a sick person in the house, and the others eat, they usually give some of the food to the patient’. ‘The patient has eaten donkey meat’. ‘No’, said the people, ‘he certainly has not’. SOURCE: ARTHUR CHRISTENSEN: Contes persanes en langue populaire (Copenhagan 1918), No. 24. I will present some of my research findings on the Hippocratic approach to food and diet and how modern science can help us understand further its therapeutic value. We’ve known since Ancient times that food, exercise and lifestyle plus the external environment in which we live, have a definite influence on our health. This has now been verified beyond any doubt through epidemiological research and experiments. Good nutrition helps us to have a feeling of well-being, preserve and increase our strength and energy, maintain a healthy weight and retain adequate stores of useful nutrients, tolerate treatment related side effects, decrease the risk of infection and heal and recover quickly. 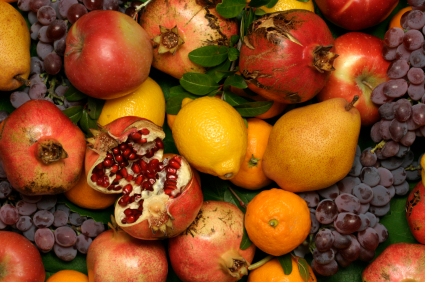 In palliative care, good nutrition can enhance recovery, when healing is possible. Poor nutrition on the contrary results in poor resistance to infections, impaired wound healing, increased susceptibility to pressure ulcers and fatigue. Good, nutritious food can also contribute to the patient’s overall sense of wellbeing. A drop in essential amino acids or glucose can adversely affect the nervous system and behaviour. Last but not least, food has a major psychological and social significance. Each one of our patients is an individual and so they need to have personalised advice. If they live alone they will need practical advice on how to prepare nutritious food when, at the same time, they can experience overwhelming fatigue. Practical advice on where to get good ‘meals on wheels’ can be extremely important for them. Their individual preferences need to be taken into account: if they like eating meat and two vegetables, they may ignore dietary advice to eat, for example, fish. On the other hand, a serious illness often leads people to make radical changes to their lifestyle in an attempt to become stronger. When Phil who was only 45 found out he had metastatic lung cancer, he turned overnight from a successful consultant physician to a patient with a life-limiting condition. During an admission to hospital for a severe infection, he lost 2 stones of his body weight. He was started on chemotherapy, which resulted in severe nausea and vomiting. 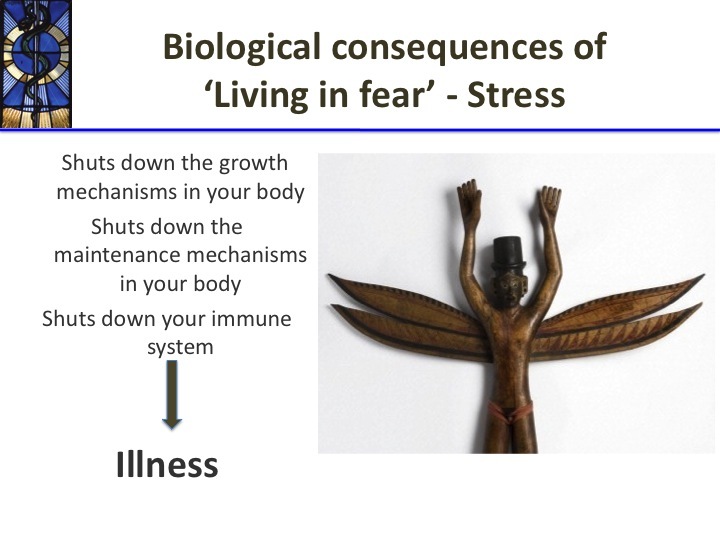 These symptoms were made worse by anxiety and fear, which also affected his appetite. More than a year later, he was strong and receiving treatment for disease recurrence to the mediastinal lymph nodes. He talks openly in this video about the physical and emotional impact the disease had on his life. One of the most significant pieces of advice he said he received during the period that chemotherapy had changed his sense of taste and smell and wiped out his appetite was, to eat porridge with honey and bananas. For a while, this was what he had for breakfast, lunch and dinner. Furthermore, exercise played a significant role in his rehabilitation. Armed with his scientific background and inquisitive mind, he sought additional ways to support himself, increase his chances of survival and improve his quality of life. He believed that ‘good food’, regular exercise, meditation, Qigong, hypnotherapy, laughter and love, combined together will help him. And I had no reason to doubt that. I supported him through his decision to change his habits and to follow ‘an anti-cancer diet and lifestyle’. We approach each person with an understanding that they are not just body, but also mind, emotions and soul; they bring their personal history, belief system, hopes and cultural background. As healthcare practitioners we seek to help the individual patient, showing compassion and care. Last week at the ‘Late Effects of Cancer Treatment Conference’ in Sheffield some of the discussion was around the importance of diet for cancer survivors. Dan Porter, a cancer survivor who spoke on the last day, said that the first thing he did after his cancer diagnosis was to find out how he could improve his diet. He said how difficult/impossible it was to find information through mainstream and how much research he had to do on his own to discover what foods and dietary changes would help him. He also commented that “scientists can become cynical and dismiss things that can be helpful to patients”. And yet, recent findings confirm that specialised aspects of nutrition play a major and hitherto unsuspected role in both the causation of disease and the regeneration on a cellular level, which of course is absolutely fundamental in dealing with cancer. The relevance of nutrition to cancer survivors is very considerable because of its tangible influence on the lengthening of life and improvement in quality of life, even in terminally ill patients. The emerging significance of nutrition means that even undergraduate students need to be made aware of these important developments in the treatment of cancer, which must not be neglected in shaping the treatment of cancer survivors. Through my work as doctor at the Penny Brohn Cancer Care (PBCC) charity in Bristol and as a palliative care doctor in a hospice and the community, I have witnessed the importance of nutrition throughout the cancer patient’s journey. PBCC have produced evidence-based Healthy Eating Guidelines and have been offering nutritional advice for many years to hundreds of patients who come to benefit from their experience. In my role as Chair of the Food and Nutrition Group at ‘Help the Hospices’, we have produced a Consensus Statement on Nutritional Care of Palliative Care Patients which has been widely endorsed by several organisations, including the Royal College of Physicians, The Royal College of Nursing, the British Dietetic Association, the National Council for Palliative Care and others. This shows the realisation by healthcare professionals of the importance of good nutritional care for people with palliative care needs. This importance can be easily translated and indeed extended to initiatives for cancer survivors who have a great opportunity to benefit from a good diet. Patients, survivors and users ask first and foremost this question: ‘what should I eat’. They want to help themselves. They want information and support to understand how they can improve their diet and lifestyle in general. Learning what foods are going to help them live better and longer, what foods will support their immune system and give them pleasure, could transform their experience and make their cancer journey less difficult. During their treatment, they may experience a plethora of problems (nausea, vomiting, constipation, diarrhoea, loss of appetite, dry mouth, mucositis, pain, shortness of breath, reduced saliva, unexplained weight loss) that can be helped by good nutritional advice. These can be dealt with an individualised plan, as no one person is the same and everyone’s needs are different. When they finish their treatment they may continue with a healthy diet for secondary cancer prevention. An effort to highlight the importance of a good diet and offer cancer survivors support and advice would benefit both those that need it and those who care for them. The author is making a plea for the recognition that research and evidence on the relevance of diet on cancer prevention and treatment has evolved quite fundamentally and needs to be included in the future agenda for cancer survivorship. This old mediterranean recipe of soup of haricot beans, originally the traditional food of Greeks called ‘fasolada’, can be made into a full meal with the inclusion of bread. Beans and bread make up a good combination providing complete proteins. 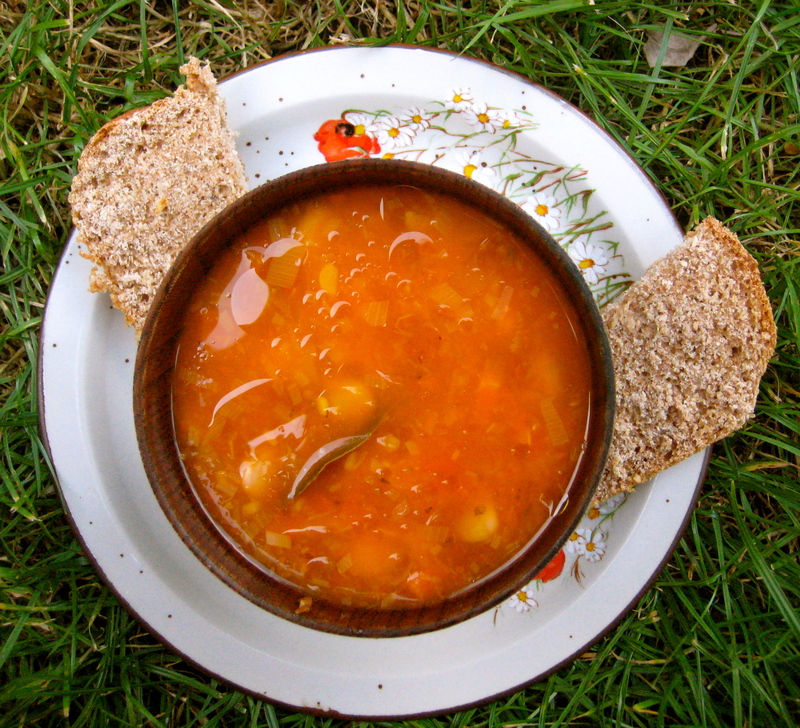 Τhe addition of onion and garlic, herbs, spices and tomatoes make this soup a very nutritious food. Remember to chop the onions at least 10 minutes before you cook them, so that they keep their therapeutic properties. In contrast, the more you cook tomatoes and carrots the more nutritious they become! If you have some (or if you are from Kozani in Greece where they grow it!) add a pinch of saffron (κρόκο). It will give extra colour and aroma to the soup and make it an even more ‘anti-inflammatory food’, which is what we need to feel young and healthy. In a large saucepan over medium heat, warm the oil. Add the onion, carrot and garlic and sauté until the vegetables are softened, about 5 minutes. Don’t let them get colour. Stir in paprika and oregano and cook until fragrant, for about one minute more. Add beans and half of the water, bring to the boil on rapid fire, reduce the heat, close the lid and let it simmer for 30 minutes. Check the volume of liquid every 10 minutes, add the rest of the water. Add the tomatoes when beans are cooked half-way through; acidity will harden the outer shell of the bean if added straight away. Season, add 2 slices of lemon, simmer until the beans are soft. When you serve the soup in the bowl, drizzle with olive oil and a bit of lemon juice over it. Serve with bread and olives. However, those who have been dismissive of Nutritional Science, once the Cinderella of scientific studies, are now literally ‘having to eat their words’. There is increasing and compelling evidence of how nutrition can benefit people. Research has gone into such detail that it has demonstrated how carrots and tomatoes provide more nutrients the longer they are cooked; while onions, leeks and garlic need to be chopped at least ten minutes prior to cooking in order to stimulate their active ingredients. Use them in cooking before 10 minutes after they are chopped and they give their characteristic taste and smell but not their active ingredients. Spices and herbs have also been shown to provide health benefits; for example turmeric has anti-inflammatory properties. In fact, research has now shown that turmeric is better absorbed and its’ effects in the body are multiplied, when it is eaten together with pepper and fat as in a curry. The ‘Nutrition Now’ campaign of The Royal College of Nursing acknowledges the importance of good Nutritional Care with the principle that food and drink are as important as drugs in patient care. When researchers have asked patients and carers what else they want besides expert medical treatment the answer is clear: they want information and advice on how to help themselves; just having things done to them is not enough. It rings true; we all want to be empowered to do something for ourselves. This really underlines why nutrition is so important. Finding a recipe for someone’s condition that they will also enjoy can provide great pleasure, nutritional benefit and be the simple expression of love by the carer. When times are difficult and everything around us seems to be falling apart it is important to take special care of our health. Greece is currently in turmoil and people are facing tremendous difficulties, being exposed daily to negative news. This is the time to help each other and support our Greek friends in any way we can. I am giving a talk in my hometown Kozani in Northern Greece, to a lay audience. I hope to convey a number of useful, practical ideas that can be found in the wise words of the father of Medicine Hippocrates. These can help each one of us improve our health in a simple, straightforward way. From the Ancient Egyptians to Hippocrates and to modern scientists the sun has been at the epicentre of interest for its healing properties. Enjoy it sensibly and responsibly! 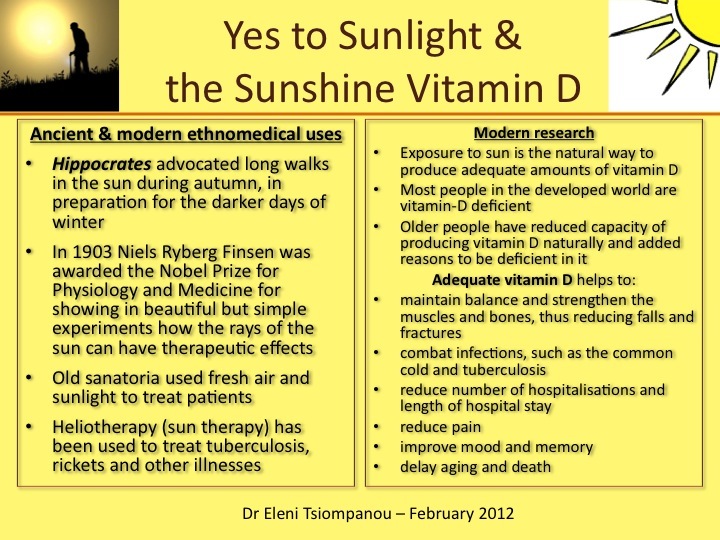 Make sure also your old relatives and friends get enough sun and vitamin D.